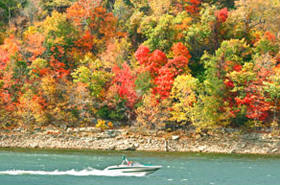 Table Rock Lake offers spectacular opportunities to enjoy its unique natural beauty. Table Rock Lake's water is a calm, beautiful blue, reflecting the bright, cloud-filled sky. The relaxing atmosphere makes the lake the perfect place to enjoy the outdoors, and it is a very popular destination for swimming, sailing, diving, and fishing. Table Rock Lake is surrounded by gently-rolling, wooded hills. This gentle landscape is a great place to play golf or go hiking, camping, and birding. The sunsets – both from the water and the shore - are truly breathtaking, with brilliant shades of red, pink, yellow, and gold filling the sky and delighting visitors and residents.